My grandmother’s brother spent some time in Brazil during WWII, and although he probably didn’t immigrate officially, I figured I would take a look. I didn’t find a record (although looking at the collection it looks like only half of the images are indexed so far), but looking at the record Todd Knowles had used as an example, I saw something very interesting. Her record shows she was born in Jerusalem. 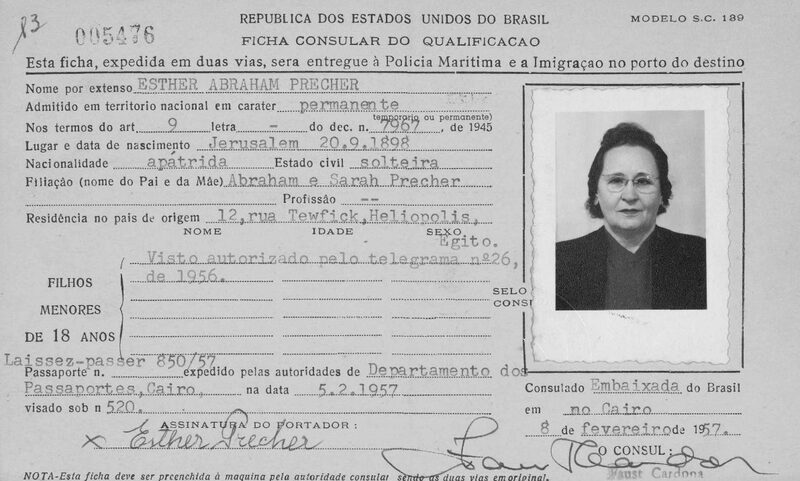 Why was a woman born in Jerusalem moving to Brazil in 1957? Of course, I can’t be certain as to why she moved, but I can make an educated guess. If you look closer at the immigration card, you can see that she was born in 1898 in Jerusalem, but that her passport had recently been issued in Cairo. It would seem that while she was born in Jerusalem during the Ottoman period, she at some point (perhaps when she got married) moved to Egypt. Her immigration occurred just a few months after the 1956 Sinai War, where Egypt fought a war against Israel (along with Great Britain and France). While being Jewish in most Arab countries was difficult after Israel was founded, it was probably particularly dangerous to be in Egypt after they had just fought another war with Israel. Over half the Jewish population of Egypt were forced out of the country in this period, and were forced to leave all their asset behind. Even if she had wanted to go back to Israel where she was born, it probably was not possible given the political situation, so she probably went wherever she could get a visa for, which in this case was Brazil. Interestingly enough coming after my last article on Food as Genealogy – Iraqi Kubbe, this was much the same motivation for the many Iraqi Jews and Jews from all Arab countries that were forced to flee their homes for Israel, the United States or elsewhere. This was not a good time to be Jewish in any Arab country (and unfortunately the situation has not improved since – Egypt and Iraq both had flourishing Jewish communities dating back to the 2nd Temple period, and both have less than 100 Jews each today). If you search for records in the Brazil collection, you would find there are actually 243 records that list a birthplace for the person as Israel. 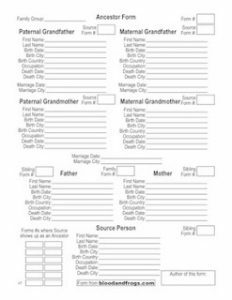 You could widen your search to all mentions of Israel in all databases on FamilySearch, and you’d find that there are 8728 records (as I write this article) which list Israel as a location in the record. Of course, if you were trying to find someone in a record that was created before the State of Israel came into being, it would not list Israel. You could therefore search for Palestine which was used as a place name by some (although people would also say Ottoman Empire, Ottoman Turkey or Turkish Empire), where you would find 13,892 records (as I write this). You could also search for specific cities, such as Jerusalem (5650 records), Tel Aviv (434 records) or Haifa (337 records). Some of the Jerusalem results will probably be records from other towns called Jerusalem (did you know there was a Jerusalem, Ohio?). Jaffa, for example, came back with over a million records, which doesn’t make much sense. If you search for Jaffa, Palestine, however, you get 9489 results which at first glance seem mostly Jewish. 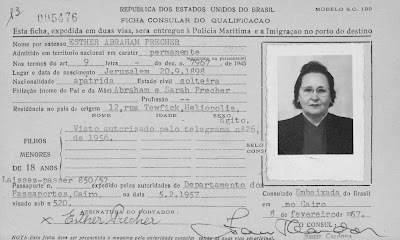 Anyways, the Brazil Immigration Cards database is a very interesting collection for those with connection to Brazil, but for anyone who knows they had family in Israel at some point in the past but may have moved elsewhere, this is an interesting way to search for records that may help you in your research. An interesting post. I think it’s important to know some history in doing genealogy work as you indicated when you made the point about the Jewish exodus from Egypt in the 1950’s. Ariel Sabar’s My Father’s Past: A son’s search for his father’s past in Kurdish Iraq, 2008. I haven’t found any written about Brazil yet, but I have reviewed a very interesting memoir called Hotel Bolivia by Leo Spitzer about a community of mostly German Jews who managed to escape to Bolivia before they were rounded up. Memoirs are engaging ways to deepen your knowledge about historical events, culture, geography . . . I don’t know if any of these books are available in Israel but I’m thinking that as older books also become available as e-books they will be available to readers wherever they are. Thank you for your comment. Those memoirs look very interesting. I like your site, where you review the memoirs and list the people mentioned. If you don’t already, I highly recommend Google Books (http://books.google.com/) to use for searching for memoirs from specific locations. Since it can search inside the books, and show you excerpts, it is very useful for this task. After a quick search I found one Jewish memoir from Brazil, that of Jewish leader Samuel Malamud (Do Arquivo e da Memória – Fatos, personagens e reflexões sobre o sionismo brasileiro e mundial) published in 1983, although it is in Portuguese. According to WorldCat.org, it’s in the Columbia University library and the NYPL if you’re interested. One other interesting note. 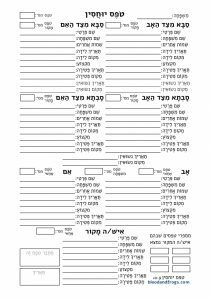 When I moved to Israel in 2003, I attended ulpan to learn Hebrew, at an ulpan geared towards college-educated immigrants from around the globe. This was right after the Argentinian economy collapsed so there were a lot of Argentinians there, as well as people from France, Mexico, and one person from Bolivia. He was a dentist if I recall correctly. He didn’t speak any English and our Hebrew wasn’t good enough to communicate much, so I have no idea when his family first moved to Bolivia, but it was interesting to meet a Jewish person from Bolivia (and he is still the only Jewish person I’ve ever met from Bolivia). Thanks, I’m glad you like my site. I know about Google books, but I don’t read Portuguese. Although I have a list a mile long of other titles to review,I am always looking for suggestions. What’s interesting about the Jews from Bolivia, as opposed to the Jews from Argentina, is that most of them left Bolivia when they could get out. The refugees who fled to Shanghai also moved on after the war. I posted a review of a very interesting memoir written about growing up in Shanghai – Strange Haven: A Jewish Childhood in Wartime Shanghai by Sigmund Tobias.